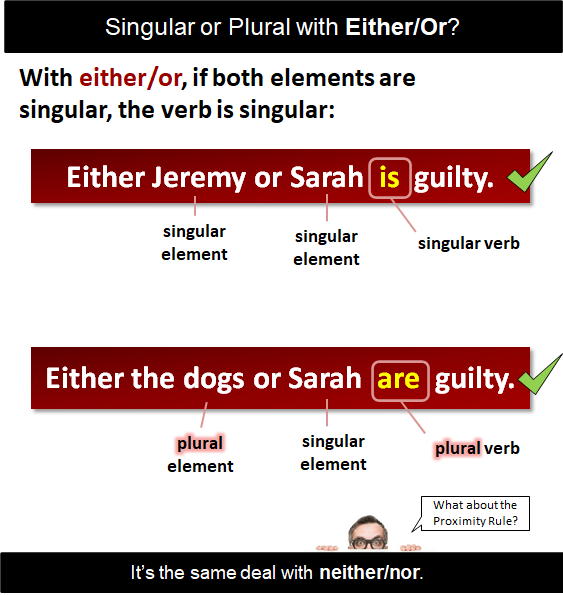 Either and Neither | Singular or Plural Verb? Is Either Singular or Plural? Neither of the boys is trying. Shortbread or cake is on offer. Chocolates or cake are on offer. Chocolates or cake is on offer. The word either can be a pronoun or an adjective (more specifically, a determiner, which is a kind of adjective). Either means one or the other of two things. Either is a singular concept. Neither of the men is suitable. Neither Mark nor Dawn is at the function. Neither Dickens nor Thackeray was a panderer to the public taste. Either the clerk or the secretary has the keys to the Land Rover. Either a mouse or a rat eats the cable at night. Neither Simon nor Gary do as they are told. (As Simon is singular and Gary is singular, do is wrong. It should be does. NB: Sometimes, you have to look further down the sentence too. This should be does as he is told. Read more about his/her and their. Neither the lawyer nor the detectives are able to follow the sequence of events. There were neither cakes nor ice-cream at the party. Neither the firemen nor the policemen know him. Either the budgies or the cat has to go. The pairings either/or and neither/nor are known as correlative conjunctions. The words that follow either, or, neither, and nor are known as the elements. Either tea and crumpets or cake are sufficient. Neither Jeremy nor Sarah was in the shop at the time of the theft. Either crumpets or cake is sufficient. There was neither ice-cream nor chocolates at the party.